The person who showed me around Brookdale Mankato was very nice. It's just too small of an area. There are only 18 beds. They have bingo. The dining area looked very good. The rooms at Brookdale Mankato, formerly Sterling House of Mankato, were small, and the number of patients was relatively small. They clustered the rooms around a main area which they use as a dining room. They also use it for community meetings. Because there was a small group of people, it served more as a community. Oftentimes, the staff would provide an opportunity for the residents to watch the food being prepared. However, it would be nice to have a little bit larger room. My uncle is in Brookdale. I think it is a really good place. They do a good job of caring for him. I guess the only negative possibly is that they don't do a lot with him that I see as far as taking him out, doing things, and stuff like that. The staff is good. The room is fairly small, but it is nice and well kept. The food is good. The dining room is right in the middle of the complex. I think there are only 20 to 25 residents, so it is not that big, but it is not crowded either. I have not seen any activities yet, but I think they play bingo in the facility. In the very beginning, they told me that they take them out, go places, and do things. I met with Geri to ask about a place for my diabetic father-in-law. Her care and compassion for me and all the questions I had are beyond words. The staff was very upbeat and had such a caring attitude to the residents. The place felt very cozy and homey with a warm, hospitable home the minute you walked in the door! We went to Sterling House. I didn't like this place at all. I couldn't find anybody there. There was a crabby resident. It was dingy. I didn't like it. It wasn't a fit for my mother-in-law. I walked in and I saw one person in the kitchen that didn't know anything and I walked out. I walked out after walking around and getting yelled at by one of the residents, so that wasn't a good experience. Thank you for taking the time to share your concerns. We are committed to continuous quality care and will share your feedback with our team to address the issues you have raised. I like that Sterling House of Mankato was clean. Everything was good. It was a nice place, but it's just way too expensive. The food was very good and the staff were friendly, but the rooms were small. Thank you for taking the time to share your thoughts about our community. Your feedback is always considered and appreciated! I had a tour at Sterling House of Mankato. It was very pleasant. I believed because it was a small facility, it had more of a home type feeling. You just had a good feeling the minute you walked in the door. The building looked very nice and the upkeep looked very good. The staff and the residents that were there were nice. The gal, I believed her name was Jerry, she was so nice and so kind. She made me feel welcome and did her best to show me everything I would have been interested in. She even called like a week later just to see how things were doing. However, they didn't have an opening. Sterling House Mankato was very nice. That would have been my choice. They're very polite, congenial, and even tried to give me suggestions on how I might try getting some help through the VA. The lady who gave me the tour, the administrator, she wasn't particularly warm. She just came in the latter part. She was very sober. She just laid the numbers out in front of me, everything they charge extra for. By the time they got to tell all the extras, it was just right under $5,000 a month. It's homey. Their visitation room or their living room is kind of small. If you want to just talk in privacy, you'd better stay in the patient's room. They did show me the room that was available, and to me it was very small. I guess some of the rooms are bigger. The activity director was a lovely person, and everybody acted very professional. I love their eating arrangement. If you're not comfortable sitting at a table with other people, you can just go up and sit at the counter. The cook is right on the other side. You have choices. You're not just saddled with eating only one thing. I found the environment lovely. I wouldn't mind being there at all myself. It was a small facility. That's very appealing. Sterling House of Mankato was really clean and the people were very friendly. The staff seemed to really care about the people. The rooms were very clean, nice and fairly large. However, the place itself was not what I was looking for. I wanted an apartment and they just have rooms. 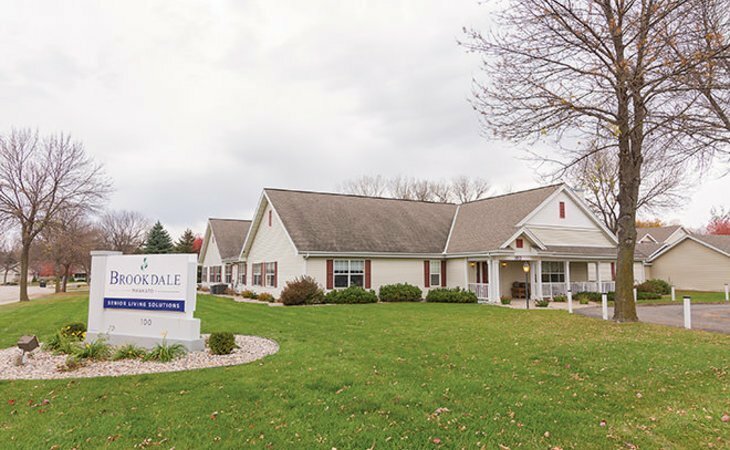 Brookdale Mankato provides assisted living residents with lifestyles, housing, and services in comfortable surroundings combined with exceptional amenities, programs, and care. Through Brookdale's signature Personalized Assisted Living, we customize our care offerings for the individual. This allows each resident at our community the freedom and opportunity to make choices that will ease their lifestyle transitions. Residents enjoy life with the support they need, coupled with the appropriate accommodations as their needs change. We promise Respect for Individual Preferences by offering personalized care needs and providing an atmosphere that encourages each assisted living resident to live in health and longevity. We also offer special housing and care options for those who require assistance with the activities of daily living such as dressing, bathing and assistance with medication. We offer graduated levels of care based upon the individual need of residents, as determined by our continual assessment process. We are dedicated to enriching the lives of residents every day with signature services for those who value their freedom and independence, but desire or need services providing them with the highest level of quality, care, and value. Small Home Like Environment with healthy home cooked meals and a variety of activites 7 days per week. Healthcare services come to us, including physician and nurse practioner visits, therapies, lab technicians, skilled nursing, hospice, and x-ray. What should caregivers and potential residents know about Brookdale Mankato?